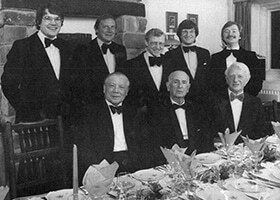 DRN partners in the 1970s, bottom row from left; Wilfred Newton, Donald Race, George Horn. Donald Race & Newton has a long and proud history. After being admitted as a Solicitor of the Supreme Court at just 21 years of age, Mr Donald Race founded the firm on April 7 1924. The original office, situated at number 10 Hargreaves Street in Burnley, consisted of just two rooms, the principal’s office and the enquiry office. Mr Race employed the 14 year-old Wilfred Newton, and three years later, 15 year-old George Horn was also appointed to the staff. Finding the two roomed office a little cramped by now, Mr Race took over a further room in the same building. As the business grew, two more employees were taken on. The outbreak of the Second World War temporarily interrupted the operation of the business. In 1940, George Horn joined the Royal Airforce and became an Airgunner. Unfortunately, he was brought down in action over the Mediterranean, was captured by the Italians and became a Prisoner of War. In 1941, Wilfred Newton went into the Army where he remained until the war ended. With ambitions to become solicitors themselves, Wilfred and George returned to the employ of Mr Donald Race following the war. Both young men became articled to Mr Race and soon qualified. Mr Race made Wilfred and George partners in the practice and the firm name was changed to Donald Race & Newton. The three partners built a large and successful practice in Burnley, which was noted particularly for its court work. Mr Race achieved considerable recognition as an advocate, acting as defending Solicitor on a number of high-profile murder cases. By now, the firm’s Hargreaves Street offices were becoming too small for the number of staff members occupying them. The practice moved to larger premises, first at 7 Manchester Road and then later to 3 Hargreaves Street. In 1954, 16-year-old Mr Derek Lambert joined the firm as an articled clerk, and was articled to Mr Newton. Derek was admitted as a Solicitor with Second Class Honours at 21-years-old. The firm continued to thrive and expand, and over the following few years Peter Lawson, Roger Pickup and Wilfred’s son, Simon Newton, all joined as articled clerks. Peter, Roger and Simon became partners in the practice not long after. In the early 1960s the firm took over the practice of Birtwells and moved into Birtwell’s large offices on Nicholas Street. A further office was opened in Nelson in 1958, and the firm went on to purchase the practice of Bracewell and Dyson on Albert Road in Colne (where we still have an office). In 1989, Donald Race & Newton incorporated the long established Burnley firm, Holmes Butterfield and Hartley, (which had been trading since the 1880s) increasing the firm’s presence in the town. In 2007, the practice purchased the large former Lloyds Bank building on Hargreaves Street in order to accommodate the firm’s growing staff numbers and in order to have everyone in Burnley working under one roof. In 2013, the firm opened their newest branch, a dedicated commercial office, DRN Commercial, in order to satisfy the increasing demand for its commercial services. Throughout the firm’s ninety year history, Donald Race & Newton has remained true to its founding principles of providing expert advice and representation delivered through outstanding service.